Hi everyone! It's time for a new issue over at Paper Issues...The Perfect Pairing! We are teaming up with Epiphany Crafts. Some of the PI girls got the chance to work with their fun epoxy shape tools, bubble caps and charms. The Epiphany Crafts design team played with the fabulous Paper Issues Swag Bags. Head over to the Epiphany Blog to see what they created and find out how you can win a swag bag. Here's my project. I used the oval Studio Shape tool and the swag bag to create my card. That ladybug! So adorable! 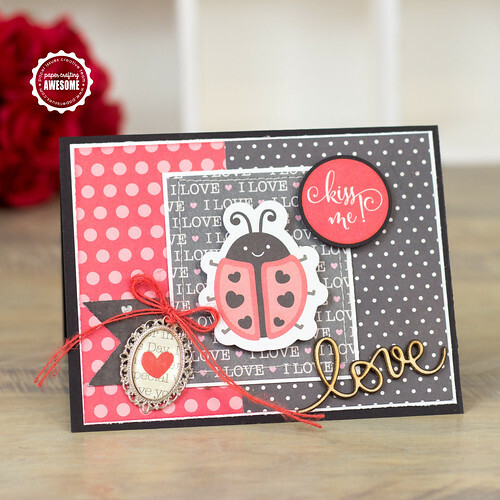 If you haven't tried the Swag Bag yet, it's a great way to try some new embellishents. It comes filled with tons of 3 x 4 cards (used as my background). You can find out more about it here. Head on over to the Paper Issues and link up for a chance to win this fabulous prize. Such a cute card Corri! !